With differentiated activities all in one book, Allez is a perfect fit for all your students, no matter what their starting point at KS3. Allez avoids needless topic repetition and allows more in-depth study and progression with a clear route through for students following a two or three year course. 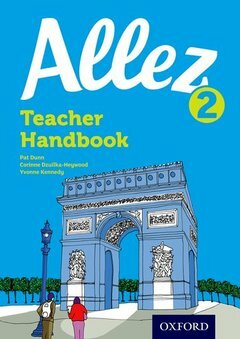 Allez is packed with activities set in real contexts that are close to students' own interests to maintain motivation. The Teacher Book contains all the teacher's notes, answers and transcripts that you need, plus much planning material to save you time: unit contents plans, two-year and three-year teaching route plans, suggestions for starters and plenaries etc. The Allez course has a full suite of resources to support your needs: the Student Book, Teacher Handbook, Grammar and Skills Workbook, Audio CDs and next generation Kerboodle. Differentiation is provided throughout the Student Book and via Kerboodle.